Over the past 8 years or so, there has been more and more attention focused on the relationship between telomeres, health, and longevity. There have been more than 10,000 scientific articles published about telomeres. Telomeres are the caps at the end of each strand of DNA that protect our chromosomes. Think of them like the plastic/metal tips (aglets) at the end of your shoelaces. In more technical terms… Telomeres consist of DNA repeats and associated proteins located at the ends of the chromosomes (Blackburn et al., 2006; de Lange, 2005). Telomeres play an important role in maintaining genomic stability and regulating cellular replicative capacity (Allsopp et al., 1992; Blackburn et al., 2006). Telomere length is heritable, and length declines with increasing age (Njajou et al., 2012; Nordfjall et al., 2005; Shammas, 2011). When you lose your aglets, your shoelaces fall apart and no longer function properly. Without telomeres, your DNA strands become damaged can’t function properly. 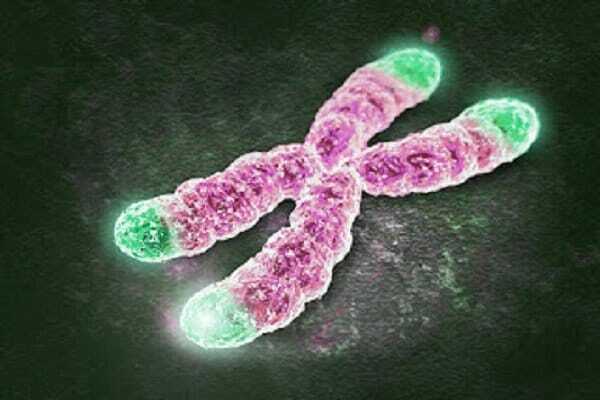 Shortened telomere length eventually leads to the inability of the chromosome to replicate at all. When the telomere length shrinks to a critical level and chromosomes can no longer replicate, the cell dies by a process called apoptosis. For this reason, longer telomere length indicates more youthful, healthy cells. Especially in early life, the impact of inheritance on telomere length is strong, but it seems to diminish by age (Svenson et al., 2011). Shorter telomeres have been associated with increased incidence of several chronic non-communicable diseases and with shorter life span (Ludlow and Roth 2011; Shammas, 2011; Salpea and Humphries, 2010; Wong and Collins 2003). Several factors including smoking, obesity and an unhealthy diet, all conditions associated with an increase in oxidative stress and inflammation, have been linked with telomere shortening (Crous-Bou et al., 2014; Ornish et al., 2013; Shammas, 2011; Tiainen et al., 2012; Woo et al., 2010;). It is believed that telomere length could be a biomarker of biological cellular age and thus predicts morbidity and mortality (Bojesen, 2013; Woo et al., 2014; von Zglinicki and Martin-Ruiz, 2005). A 2010 study from Harvard Medical School showed telomere shortening to be a root cause of cellular aging. Jaskelioff M, et al. Telomerase reactivation reverses tissue degeneration in aged telomerase-deficient mice. Nature. 2011;469:102-107. OK, enough of that—you get it. Long telomeres are good, and short telomeres are bad. So, here’s the really obvious question. How do you preserve telomere length? Research demonstrates that there is a direct association between reduced telomere shortening in your later years and high-intensity exercise. “The results of the present study provide evidence that leukocyte telomere length (LTL) is related to regular vigorous aerobic exercise and maximal aerobic exercise capacity with aging in healthy humans. … as LTL shortens with aging it appears that maintenance of aerobic fitness, produced by chronic strenuous exercise and reflected by higher VO2max, acts to preserve LTL. Stepwise multiple regression analysis revealed that VO(2)max was the only independent predictor of LTL in the overall group. Our results indicate that LTL is preserved in healthy older adults who perform vigorous aerobic exercise and is positively related to maximal aerobic exercise capacity. This may represent a novel molecular mechanism underlying the “anti-aging” effects of maintaining high aerobic fitness. Excerpted for David Woynarowski’s reply in a comment thread at the Ted.com Conversation Archives. David Woynarowski is an author of Immortality Edge. Song et al. have demonstrated that duration of exercise inversely correlates with biomarkers for damage to DNA and telomeres and with p16 expression, a biomarker for aging human cell. Exercise can reduce harmful fat and help mobilize waste products for faster elimination, leading to reduced oxidative stress and preservation of DNA and telomeres. Werner et al. [62•] showed that exercise was associated with elevated telomerase activity and suppression of several apoptosis proteins, including p53 and p16, in mice. Consistently, in humans the leukocytes derived from athletes had elevated telomerase activity and reduced telomere shortening, relative to nonathletes [62•]. Exercise seems to be associated with reduced oxidative stress and elevated expression of telomere stabilizing proteins and may therefore reduce the pace of aging and age-associated diseases. You start out with an average telomere length of about 15,000 base pairs. When you get down to 5,000 base pairs or less, you start getting into trouble as your cells start to die off or shut down. To slow down this process of “erosion,” high intensity training is key. SABER (supramaximal) training is the single-most effective method to accomplish efficient high intensity training.